How to view iPhone photo slideshow on PC? Home » How to view iPhone photo slideshow on PC? The iPhone screen is too small to share photos with your friends. Why not use the large PC screen and CopyTrans Photo to play stunning full-screen slideshows of your iPhone photos? You can view slideshows of iPad photos or iPod Touch photos too. Install the program. If you need help installing, please refer to the Installation guide. Run CopyTrans Photo and connect your iPhone, iPad or iPod to the PC. The iPhone photos will appear on the left, while the PC photos will appear on the right. To view iPhone or PC photos in a slideshow, choose the range of photos, right click on them and select “Slideshow” button. Alternatively, you can simply press the Ctrl + L combination to play the slideshow. A slideshow with the iPhone photos will begin in a full-screen mode. 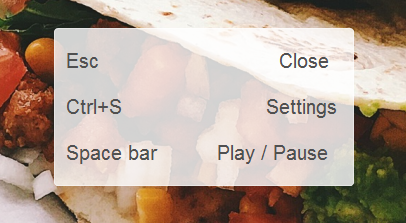 Pause and play slideshows by pressing the space bar on your keyboard. 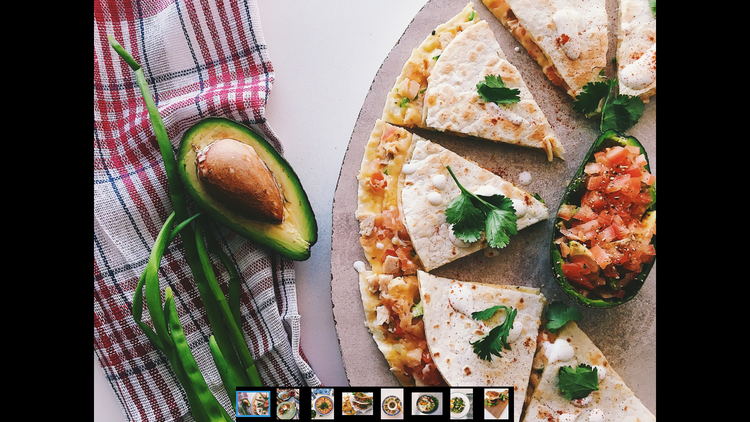 Use photo thumbnails which appear at the bottom to click on a photo you wish to display straight away. Exit from slideshows by pressing the “Esc” key. Press “CTRL + S” key to view the slideshow settings. For instance, you can modify the background color, photo position on the screen, display photo count or photo name, etc. 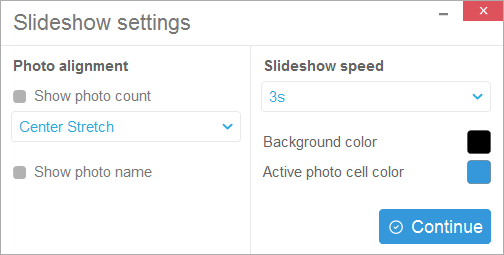 Once satisfied with the slideshow settings, click “Continue”. 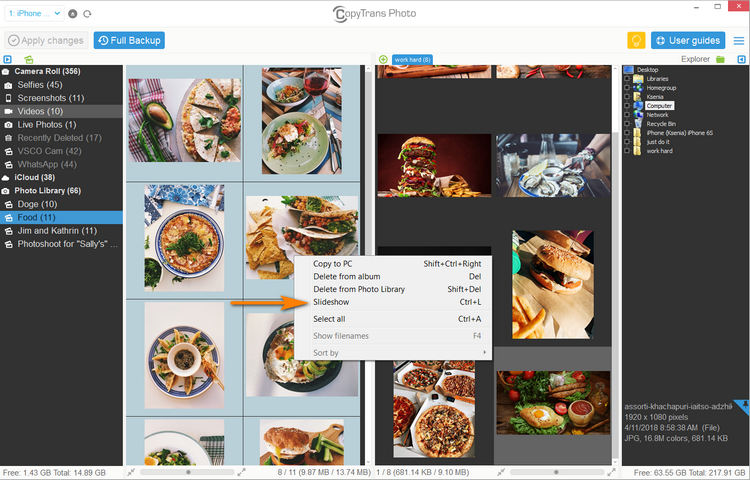 Use the left and right arrow keys on the keyboard to go through slideshow photos at your own pace. You can connect the PC to a TV screen for an even better experience! 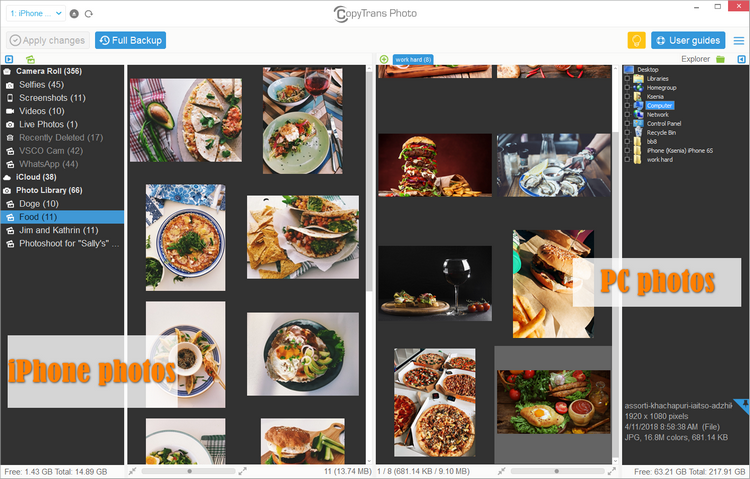 This is how to view iPhone or iPad photos in a slideshow on the PC.